This page contains pictures and information about Pyrgomorphs in Family Pyrgomorphidae that we found in the Brisbane area, Queensland, Australia. This family is very close related with the Family ACRIDIDAE and sometimes put under ACRIDIDAE as the subfamily Pyrgomorphinae. Member in this family have a cone-shaped head. Usually they hide on grasses, not quite jump or fly. Some of them (Tribe Atractomorphini and Psednurini) are green in colour and protected by the camouflage colour while others (Tribe Monistrini) have bright warning colours. They have short antenna and stout body. They feed on leaves and most species feed on wide range of plants. There is a single subfamily (Pyrgomorphinae) in this family which contains five tribes. We found species in three tribes in Brisbane. This is the largest tribe of Pyrgomorphs. Most of them are short-winged, although long-wings form can sometimes be found. They are usually very colourful. However, we have only one species found in Brisbane and which is black and creamy white in colour. Common Pyrgomorph adults have reduced wings and flightless, but long-longed form can sometimes be found. From the reference information their habitats are dry area include the dry sclerophyll forest. They feed on leaves of board range of plants. Please check this page for more information. This is a small Tribe. 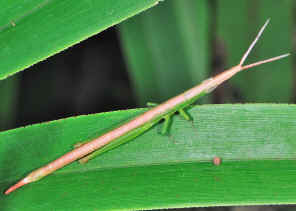 Pyrgimorphs in this tribe have cylindrical or stem-like body. Adults have reduced wings and flightless. The front two pairs of legs are short and tiny. 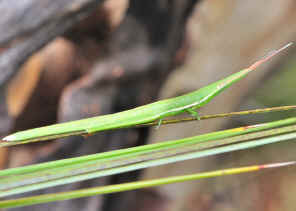 They are usually found rest on upstanding grasses or sedges. 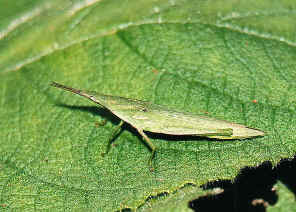 This Pyrgimorph can be found on grasses and sedges. 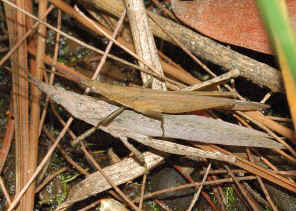 Its stem-like and slender body make them camouflage well when they are hiding within grasses. They rest with head upwards, holding the grass stem with the front two pairs of tiny short legs. We have more information about them in this page. There are three species in one single genus in this tribe. In Brisbane two species can be found. 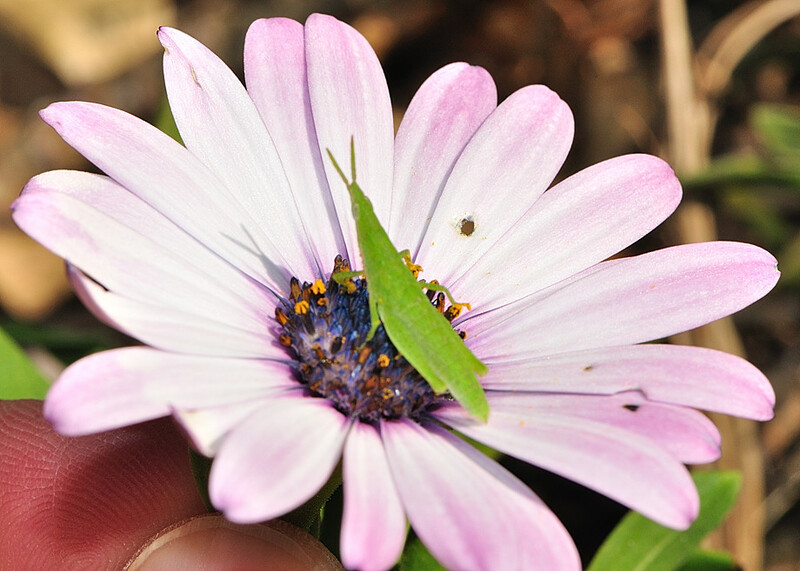 Grasshoppers in this tribe are green in colour. Adults are fully winged. This grasshopper is also known as Vegetable Grasshopper. 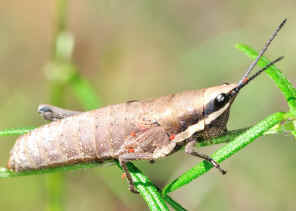 They are common in Brisbane and easily found on grasses and other garden plants. They are medium size and grass-green in colour. 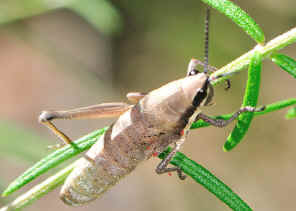 The insects above could be Atractomorpha similis or A. australis. Both species look very similar and can be found in Brisbane. Please check this page for more details. 1. Insects of Australia, CSIRO, Division of Entomology, Melbourne University Press, 2nd Edition 1991, p388. 2. Grasshopper Country - the Abundant Orthopteroid Insects of Australia, D Rentz, UNSW Press, 1996, p169. 3. A Guide to Australian Grasshoppers and Locusts - DCF Rentz, RC Lewis, YN Su and MS Upton, 2003. 4. A revision of the Psednurini (Orthoptera : Pyrogomorphidae) - KHL Key, 1972, Australian Journal of Zoology Supplementary Series 20 (14) 1 - 72. 5. A Revision of the Australian Atractomorphini - KHL Key and DK McE.Kevan, 1980, Australian Journal of Zoology 28 (6) 717 - 773.